Hey look, India is all over New York these days. Gujjus, Telugus, Tamils, Sardars, Mallus and Marathis, you can see all of them and more varieties of Desis in New York. From the many Hindu Temples in Queens and Long Island to the scores of mostly lousy Indian restaurants to the Gujju-owned Dunkin Donut stores to the gawking Desi tourists in Times Square to Bollywood movies to news-stands in Manhattan and the glittering jewelry stores in Jackson Heights, India is everywhere in New York. Just look around to see India in New York. 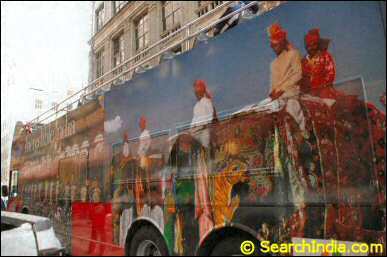 Hey, India is present even on those red double-decker tourist buses in NYC. You are never homesick in New York.